You will also need, oil for deep-frying and extra caster sugar. Combine yeast, water milk and sugar in small bowl. Cover, stand in warm place about 10 minutes or until mixture is frothy. Stir butter and eggs into yeast mixture. Sift flour into large bowl, stir in yeast mixture and rind, mix to a soft dough. Cover, stand in warm place about 45 minutes or until dough has doubled in size. Turn dough onto lightly floured surface, knead dough about 5 minutes or until smooth. Roll dough until about 1cm thick, cut into 5cm rounds. Brush half the rounds with egg white, drop about 1 tsp of jam in centre of each round, top with remaining rounds, pinch edges together. Re-roll remaining dough, cut into rounds, repeat with remaining egg white and jam. Loosely cover rounds with oiled plastic wrap, stand in warm place about 10 minutes, or until almost doubled in size. Deep-fry doughnuts in batches in hot oil until well browned, turning once. 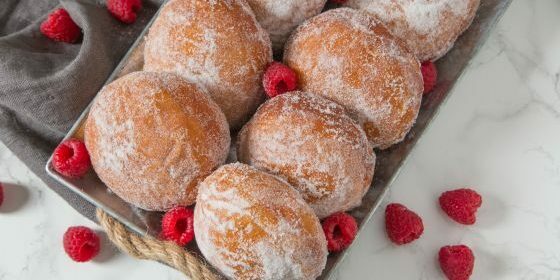 Drain on absorbent paper, toss doughnuts immediately in extra sugar.